Scrap book paper is ideal for making paper beads if you want to match certain beads or if you have a color theme for a birthday, baby shower, bridal shower, Awareness ………..Kayla made these beads using bamboo roller and glazed with Vibrance. Do you know how many designs of specialty paper you can find at a craft store? Tons! There are some with texture on them like embossed paper or you can texture them yourself. These are so gorgeous and elegant! I’m new to your blog (came over via Infarrantly Creative) and am looking forward to exploring the whole site. 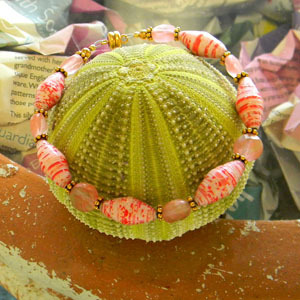 pretty bracelet, indeed! it is very bright! it’s true that the possibility of different paper are endless for making paper beads!bravo Kayla !! I love using scrap book paper too. It’s not very expensive when you consider how many beads you can make from that. 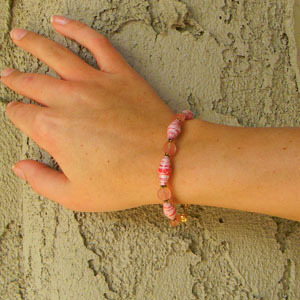 Very pretty and summery bracelet.